+The Church Cook: Booyah, Savannah Style! This hearty beef rib and chicken soup is a favorite among the Northerners but hey, we could have it here in South, too! After all, the temperature did fall way down to 60 degrees today and my family needed something like this to warm their tummies. Inspired by Cook's Country recipe, I decided to give this a try at home, in hopes to convert this recipe suitable for my church family of later on. I began with 2 pounds of back ribs and rotisserie chicken. De-bone the chicken, shred the meat and set aside. Discard the skin but reserve the carcass. Boiled the back ribs with 4 cups of water for 15 minutes. 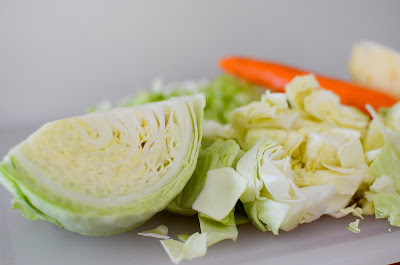 Discard the water, cleaning out the foam inside the pot with paper towel, add 8 cups of cold water to the pot, then add chicken carcass, one onion chopped, 2 stalks of celery, and two bay leaves and boil to make rich stock. After about an hour, the stock is reduced to about 4 cups. 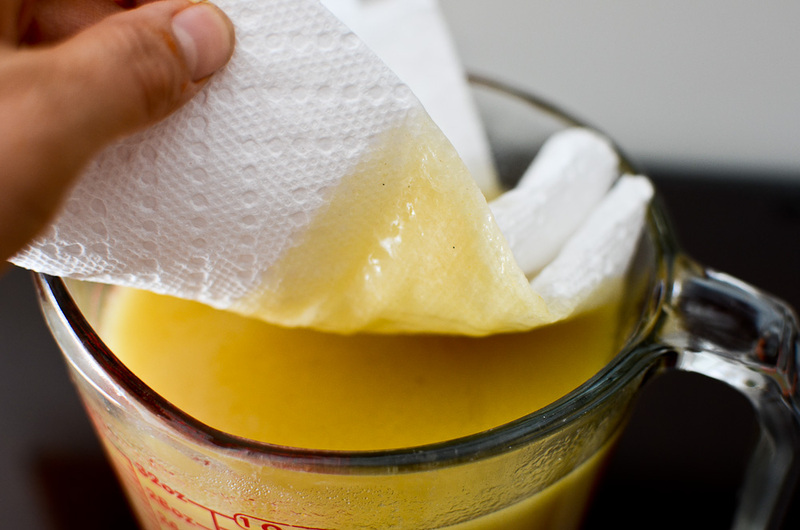 To defat the broth, lay a paper towel over its surface, quickly lift it up by a corner (the fat will adhere), and discard. Repeat with more paper towels, as needed. Chop veggies: onions, celery ribs, green cabbage, carrots, rutabaga, and potatoes. Yes, hearty and healthy! Heat 3 tablespoon of olive in the pot, stir in prepared veggies (potatoes and peas later) until fragrant, 4-5 minutes. 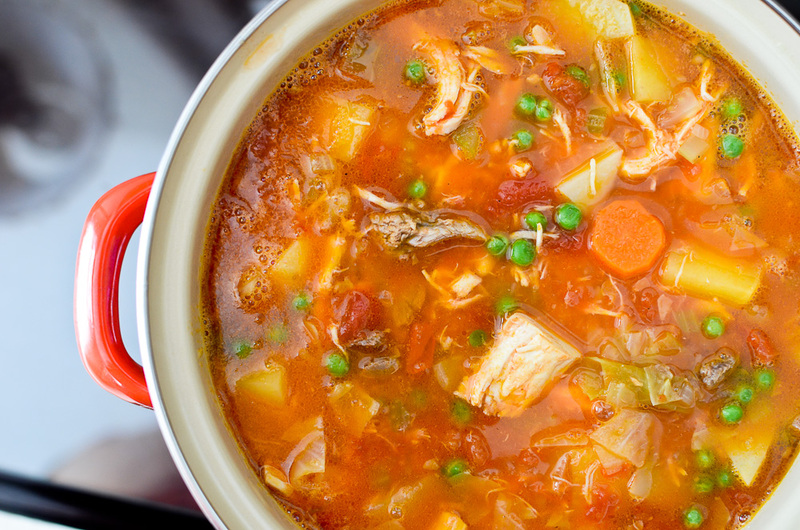 Add 4 cups of homemade broth and 4 ups more of low-sodium chicken broth, 2 cans of 28-oz diced tomatoes. Also add shredded chicken and beef meat from ribs. You know how I LOVE freshly ground nutmeg! Microplane does the perfect job for this. 15 minutes before serving, add diced potatoes. Season well with salt and pepper. And right before serving, add rinsed frozen peas. Squeeze in some Sriracha sauce to your taste. Serve with lots and lots of warm crust French bread. 1. 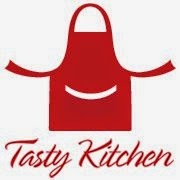 Take 2 pounds of short rib and 4 cups of cold water in 10-12 quart stock pot. Bring it to boil, then discard the water and foam, leaving the ribs in the pot. 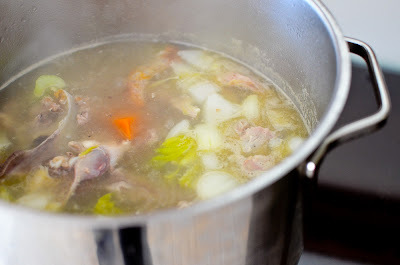 Add 8 cups of cold water, chicken carcass, 1 diced onion, 2 celery ribs, 2 bay leaves, and bring to a boil. Immediately reduce heat to bring the stock to a good rolling simmer. Simmer uncovered about 1-1/2 hours, occasionally skimming off the foam that comes to the surface. Strain the stock in a fine sieved colander into a large bowl. Defat the stock using the paper towel method as shown. 2. 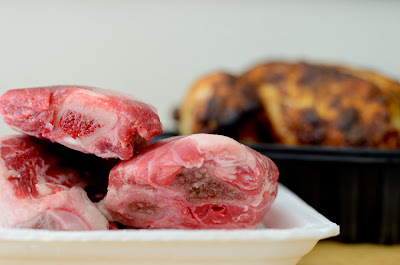 Cool ribs and cut off the meat from bone and finely shred the meat. Set aside the meat, discard the bones along with vegetable remnants. 3. In the empty stock pot, heat 2 tablespoon of olive oil, add onions, carrots, celery, rutabaga and cook over medium heat until softened, about 5 minutes. Add grated garlic. Stir in homemade and canned broth and canned diced tomatoes. 4. Add shredded beef, cabbage, 1 1/4 teaspoons salt, and 1 teaspoon pepper and bring to boil. 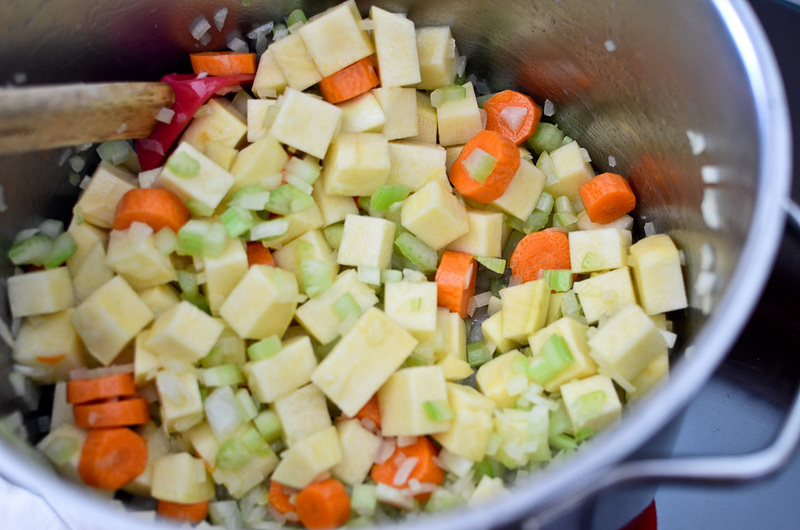 Reduce heat to medium-low and simmer until rutabaga is translucent around edges, about 30 minutes. Stir in potatoes, shredded chicken and cook until all vegetables are tender, about 20 minutes. And right before serving, add peas to stir and heat. Off heat, stir in Sriracha sauce to taste. Season with salt and pepper to taste. Serve with crusty French Bread. This soup looks awesome! I never thought to add nutmeg to soup, but I will have to definitely try that. Soup looks so good. Nutmeg is an ingredient my mom always put into soups. But, the greatest revelation is placing the paper towel on the stock to defat. I never heard of that, never thought of that, but it makes such sense!!! Thanks. Can't wait to try. Looks absolutely delicious! 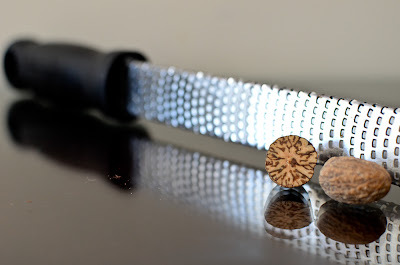 I bought the finest microplaner for my nutmeg, it works so good. Kay - this soup looks great! I like the combination of short ribs and chicken for the broth. I am sure it's very flavorful. This will certainly be added to my list of soup this fall/winter. I'm glad you are posting about this recipe, I love Cook's Country. I'm adding this to my list. what a colorful bowl of soup - Looks fabulous. Thank you so much for your encouraging comments everyone! 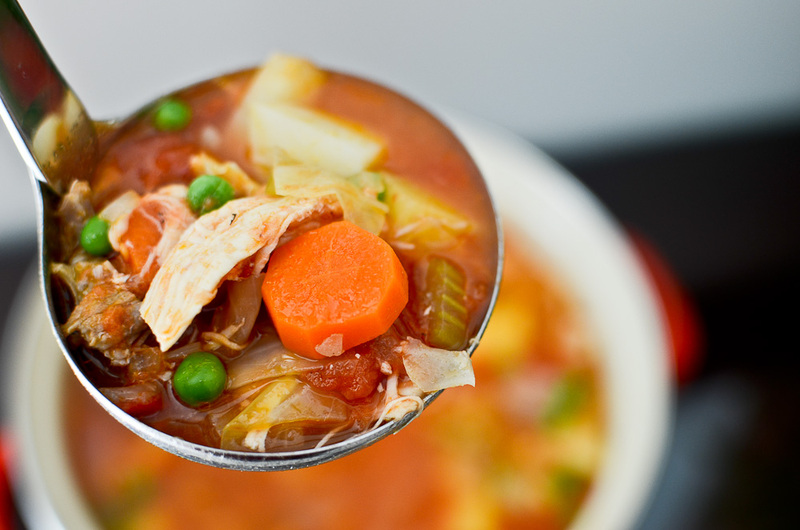 Very hearty and healthy soup indeed! Hope you will give it a try! Thanks for the recipe. It looks and sounds great! Great stew for cooler weather-if it ever stays cool in Savannah! I love your nutmeg photo!